Nature documentary with David Attenborough. Animals attempt to rear their offspring. A mother zebra must decide where to lead her young foal across the river. In the final episode of Life Story, animals attempt to rear their offspring. This takes extraordinary commitment, and a parent may even need to risk its own life for its offspring. A female turtle, returning to the island where she was born 30 years ago, hauls herself up the beach to lay her eggs in a safe place above the tide line. But her commitment may prove her undoing. The low tide traps her on the island behind a wall of coral. If she cannot climb over it, the heat of the sun will kill her. 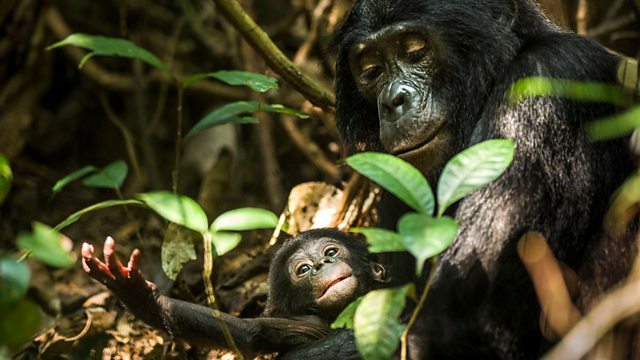 A mother bonobo chimpanzee lavishes care on her son for five years, deep in the Congo forest. Their bond will endure for the rest of her life. She will teach him how to survive in the jungle. One of her most important lessons is showing him a hidden forest pool where they harvest lilies rich in minerals essential for their good health. A mother zebra must decide where to lead her young foal across the Mara river so that they can reach new grazing grounds. Should she cross where they will face predators such as crocodiles? Or should she lead her foal through treacherous rapids? Her foal's life may rest on the decision she makes. In a touching scene, elephants delicately stroke the bones of an ancestor. We cannot know what they are thinking, but perhaps like humans they have a sense of a shared history? It is a communal experience that appears to draw the family members closer together. Discover more about animal life stories and the natural world with The Open University. How have you and the world changed since you were born? Find out more about your life on Earth.